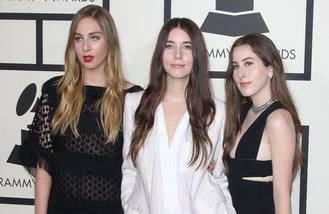 The pop rock trio - comprised of sisters, Este, Danielle and Alana Haim - have given an update on their hotly-anticipated second studio LP and revealed they are working with the 'Oxford Comma' hitmaker and coveted producer Ariel Rechtshaid, famed for his work with the likes of Madonna and Sky Ferreira, who is co-producing the record with the three girls. Alana, 25, has defended their decision to only have two collaborators on their follow-up to 2013's 'Days Are Gone'. She said: "There's a lot of cooks in the kitchen anyway. "There's three perfectionist in our band, and to add anymore people would be too much of a party." The 'Don't Save Me' hitmakers plan on releasing their sophomore album in the summer of 2017, as they want to ensure they are happy with each track. Explaining the record's delay, Alana told Entertainment Weekly: "We write everything, we play everything, and we help produce everything. "These things take time, and we refuse to put out anything we're not 100 percent in love with." The girls are thrilled for their fans to hear the new stuff and Alana teased that they can expect something very special. She added: "To get to 'Days Are Gone', it took us seven years. We are super excited for the next chapter, to just tour our hearts out and really hit the ground running in 2017. "You don't even know what's coming for you. I'm warning you. You. Don't. Even. Know." Haim were forced to abandon nine shows, including sets in at Reading and Leeds Festivals earlier this year, in order to complete the forthcoming album. Taking to Facebook at the time, the band wrote: "We'd hoped to be done with recording but as it turns out, we're at a critical point of finishing up and need to stay close to home until it's complete. Unfortunately we need to cancel our European performances including Way Out West, Tivoli, Frequency, Krakow, Zurich Openair, Reading and Leeds, and Electric Picnic. We hate to disappoint you guys that had plans to come see us and promise we'll be back in the near future to share our new music with you."